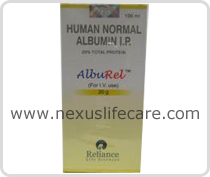 Uses:- Alburel Injection is the protein portion of the blood. Alburel Injection is important in maintaining blood volume. Alburel Injection is used in the treatment of shock, burns or low blood protein to temporarily correct or prevent a blood volume deficiency. Side Effects:- Breathing problems, chills, fever, hives, racing heart beat, sudden unexpected changes in blood pressure.